Follow the steps below to connect with a professional and accurate psychic advisor of your choice! All our experts are genuine and have undergone a rigorous testing process. Payments are safe and secure. 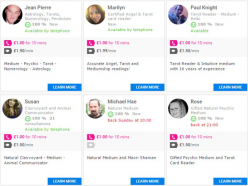 You can pay for a reading using a debit/credit card including now, Paypal. How to Connect with an Advisor? To access the profile of an expert, click on "LEARN MORE". Discover the background of the chosen expert and their specialities including other community members' rating reviews. Create a profile for free. Add your email address, choose your password and username. Your privacy is our upmost importance. Your phone number will never be disclosed to third parties nor to our experts. Select the Pay Per Minute or Packages option, we accept all major credit and credit card including Paypal. All your online transactions are safe and secure. Paying with Paypal? It is simple. Select the amount to add to your Astrocentre Wallet, it is free and you are able to top up anytime. Did not use the complete amount of you wallet? Rest assured, the remaining amount will be available for your next reading.